To achieve a more powerful thrust through the water, a surfboard designer has turned to humpback whale flippers for inspiration. A team of researchers from the University of Wollongong (UOW) has used 3D printing to create a unique surfboard fin that can increase a surfer’s power through the water. Professor of Materials Science at UOW Marc in het Panhuis looked to nature for inspiration in improving the lift-to-drag ratio. “If you’ve ever seen humpback whales, they’ve got bumpy features on their flippers,” in het Panhuis said. Similarly, wind turbines have surface features on the blade that allow for more efficiency. In het Panhuis took those sources of inspiration and used computational fluid dynamics to investigate how that changed the lift-to-drag ratio. The end result was a standard-shaped fin, with the exception of what in het Panhuis said is a crinkle-cut design. The research team had to then grapple with the challenge of getting materials that matched what commercial manufacturers use in their fins. The team spent about two years experimenting with materials by going through rigorous testing to see which combinations provided the required stiffness and flex. This included testing acrylonitrile butadiene styrene and polylactic acid, which were both discarded because they didn’t meet the stiffness requirements. “You can obviously get stiffness right with a lot of materials,” in het Panhuis said. The team finally settled on a nylon chopped microfibre composite material with a continuous fibre laid into it. 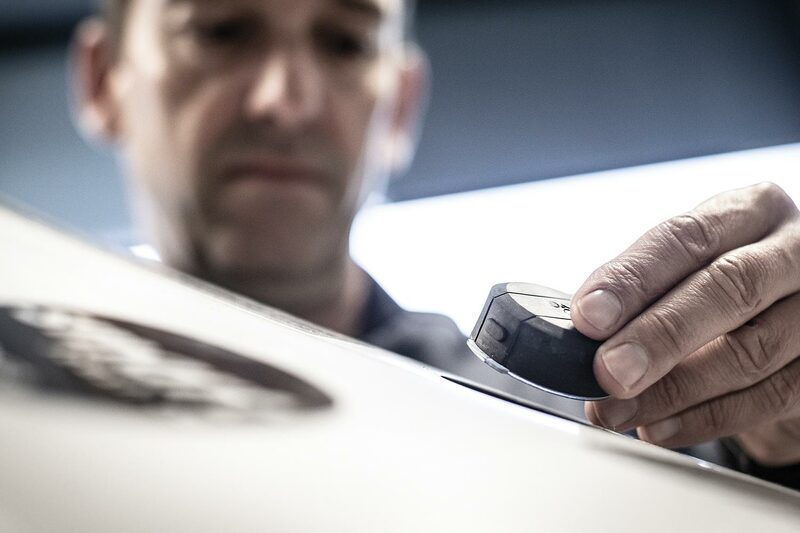 “The advantage of the materials was that we could obviously get matched stiffness of the stiffest fins that are currently on the market produced by two main fin manufacturers,” in het Panhuis said. 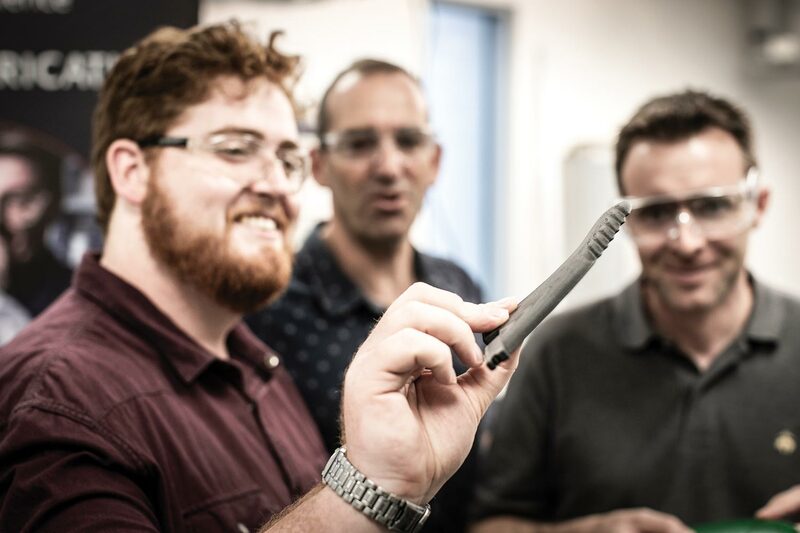 University of Wollongong (UOW) Australian National Fabrication Facility members with the 3D-printed fins. The team carried out testing at Macaronis surf resort in Indonesia by trialling three different fins — one that was a standard shape and design that had been 3D printed; one that had the crinkle cuts on one side of the fin; and a third that had crinkle cuts on both sides. To collect data, the team made special surfboards with sensors, including accelerometers, gyroscopes and a GPS system, embedded in 3D-printed holders. Each surfer also had two wearable GPS systems that gave the team information about wave points, entry speeds and the angle the board was at in turns. They also employed blind testing so surfers didn’t know what type of fin they were using, and collected subjective data from the surfers, such as the stiffness and flex of the fin, as well as visual records, such as counting every wave a surfer was on and their number of surfing moves. On top of that, they filmed everything. “We have so much data — it’s a data paradise,” in het Panhuis said. In order to handle that data, in het Panhuis and his research team worked with UOW’s SMART Infrastructure Facility to develop a number of programs that could do the data processing in the cloud. Collecting data on the fin’s performance. The results of the testing were conclusive: surfers and the data both showed better performance on the fin with the crinkle cuts on one side, with surfers saying they went faster and had more control on the waves. “We do know from our computational fluid dynamics there were some indications that the double crinkle cuts weren’t as efficient as the single crinkle cuts,” in het Panhuis said. However, one of the disadvantages of the crinkle cut fin is that it has been developed for ‘clean’, non-turbulent conditions. “So if the surf is a bit ‘messy’, then the effect of the crinkle cuts is probably no different to when you use commercial products,” in het Panhuis said. The team is now ready to commercialise the fins, which in het Panhuis said could mean looking at more traditional manufacturing methods over 3D printing to scale up production. In het Panhuis is also looking into surfboard designs and has built a flex machine to try to understand and characterise the flex behaviour of surfboards. 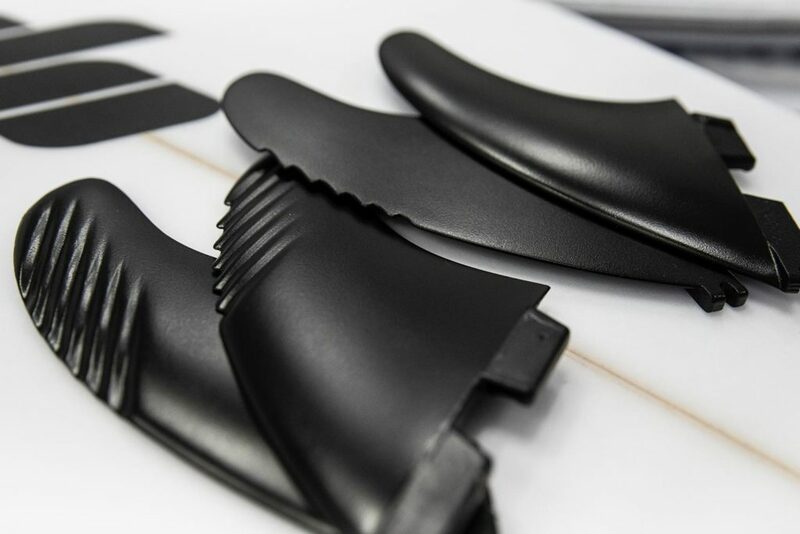 “The aim is to introduce 3D-printed components, but also traditional components in the design of fins to change the flex of surfboards,” he said. Fitting the 3D-printed surfboard fins into place. 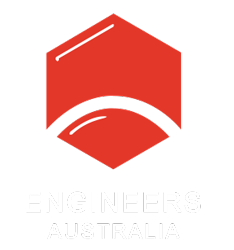 The University of Wollongong’s in het Panuis also wants to change perceptions of how a surfboard should be made, with the hope of addressing sustainability. “There are very few companies that are able to recycle the components that they use in a surfboard,” in het Panhuis said. This article originally appeared as “Whale watching” in the March 2019 edition of create magazine.